Description Estimate the probability of a germline mutation to be de novo using family history data. Citation Clinical investigation of de novo mutations in TP53 using Famdenovo. Gao F, et al. Source File: Famdenovo_0.1.1.tar.gz . The source file is compatible with windows, linux and mac os. For the details about how to install and use Famdenovo, please check the Manual . Check here for details of R package installation. 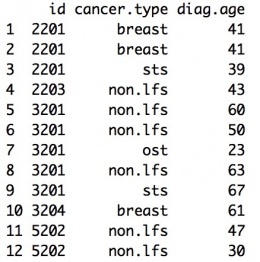 Famdenovo requires three data sets as input: family, cancer, mutation, person.id, mutation, and gene. id: index of the person. All individuals should from one family. fid: index of the person’s father. If the individual is the founder of the pedigree, set it as NA. mid: index of the person’s mother. If the individual is the founder of the pedigree, set it as NA. age: age of the person. If the individual is alive, it is as the current age. Otherwise, set it as the age of death. cancer.type: type of the cancer. We divided all the cancers into 11 groups according to NCCCN Guidelines Version 1.2012 Li-Fraumeni Syndrome criteria. Check “LFSpro.cancer.type” for details. diag.age: The age when the individual was diagnosed with cancer. mut.state: mutation status of the person. “W” - wild type; “M” - mutated. Individuals who are not sequenced are not included in the mutation information data. 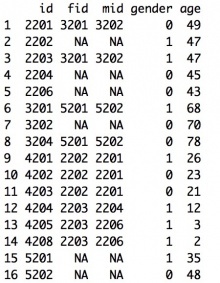 The input should be either character string(s) or numrical value(s) of the person(s) you want to analyze. The input should be character string(s). The default value is “TP53”. We will add other genes in the future. 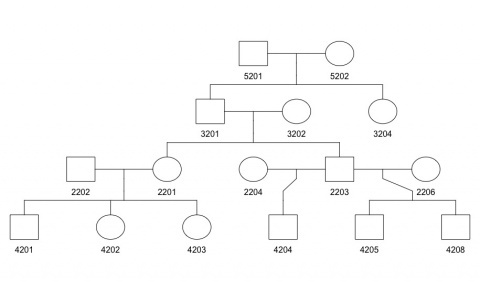 Function “Famdenovo” calculates the probability of the de novo status for a germline mutation in familial diseases. The following example briefly illustrates how to use the package. Currently we apply Famdenovo to the cancer gene TP53. The output of Famdenovo is the probability of a TP53 mutation being de novo. "The following ids are not carriers: 3202, 4203"
 "Warning: Famdenovo output is only applicatble to mutation carriers"